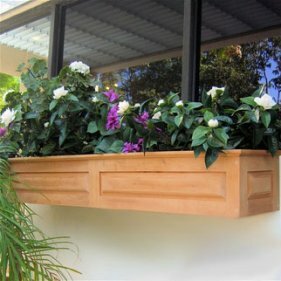 To fit your window box attach the supplied batten to the wall with the supplied screws and rawplugs and then slot the window box onto the batten. See image opposite. 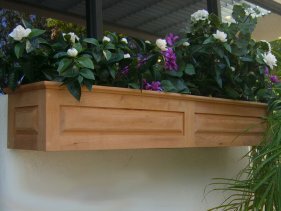 The Isis is a classic panel style windowbox that will enhance any window ledge, wall or fence. Isis windowboxes are made from Scandinavian red pine, fitted with our easy to use, concealed hanger (together with all the fixings), plus holes in the base for good drainage. If you would prefer a plain back to stand on the windowsill rather than hanging from the wall or fence, make a note in the 'special instructions' box on the way to the checkout. It can be finished in clear, golden brown or wild sage preservative. We also offer a selection of Farrow & Ball paint finishes. Many favourite window box plants- annual lobelia. African and French marigolds (Tagetes) and zinnia, for example - will only live for one year-and should be discarded once they are past their best. The same applies to hardy annuals, such as candytuft. godetia, larkspur and pot marigold (Calendula), often used in pots for- instant effect. Biennials, such as Canterbury bells and forget-me-nots, are sown in one year to flower the next, and can be bought ready to plant at the end of their first year. Daisies, stocks, sweet williams and wallflowers - all really short-lived perennials - are also best treated as biennials: enjoy their flowers for a year and then dig them out. years if the bulbs are planted in a good humus-rich, soil-based compost. The lilies shouldn't need insulating in cold weather as long as you plant them in good heavy frost-proof window boxes. boxes, but feel the dying foliage looks untidy you can surround the bulbs with bedding or foliage plants as a disguise. Keep the compost almost dry in winter and move the bulbs back into the limelight when the new shoots emerge. bulbs and start again. However, you can plant botanical 'species' forms of tulip and large-flowered hyacinths in the open ground after their first spring. hung in a cool, frost-free, dark place until replanting time. Label the tubers by colour to help you when replanting.